The Eiffel Tower 1.50 Carat Round Cubic Zirconia Baguette and Pave Engraved Solitaire Engagement Ring features a 1.50 carat 7.5mm round brilliant center stone in this unique estate style solitaire setting. The majestically brilliant round diamond look cubic zirconia center is followed by a channel set baguette on each side then a row of pave set round cubic zirconia more than half way down the shank. 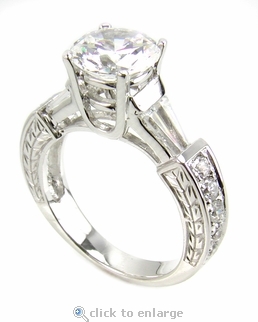 Beautiful engraved detailing also adorn both vertical sides of the shank. 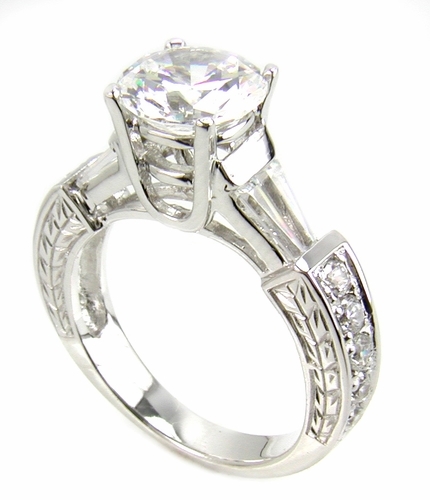 The diamond quality cubic zirconia stones set in this antique estate style ring are all hand cut and hand polished to exact diamond specifications. This solitaire is pictured here in 14k white gold but you can also special order this ring in 14k yellow gold, 18k gold or Platinum. The total carat weight is 2 carats of the finest man made diamond simulants. Due to extremely low pricing, all clearance sales are final. This clearance item may be sized for an additional fee of $35. Please see menu options below. Sizing below a 5 or above an 8 is subject to additional fees, call for a quote.